The School of Science, Engineering and Technology recently received a $100,000 grant from the Hearst Foundations to help build an advanced computer lab for the Cybersecurity program at St. Mary’s University. 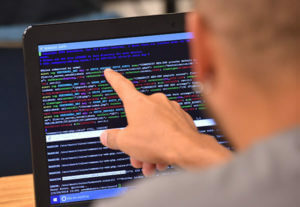 The cybersecurity lab will also serve more than 150 undergraduate and graduate students in computer science and engineering programs at St. Mary’s, in addition to local high school students who participate in summer camps. The lab, which will be located in the Richter Math-Engineering Center, is scheduled to be completed by spring 2018. “We would like students to have real machines so they can have the experience of putting their hands on real cybersecurity equipment,” said Ayad Barsoum, Ph.D., Cybersecurity Graduate Program Director. Barsoum said the lab will feature dedicated hardware and software for digital forensics, as well as a separate intranet network from the main St. Mary’s network so that students can perform experiments in cyber risk within a protected environment. “The grant from the Hearst Foundations gives St. Mary’s University resources to build a multidisciplinary cybersecurity lab to support our education, research and outreach activities in Cybersecurity, along with several undergraduate and graduate courses in Computer Science, Computer Information Systems, Software Engineering, and Computer Engineering,” said Winston Erevelles, Ph.D., Dean of the School of Science, Engineering and Technology.